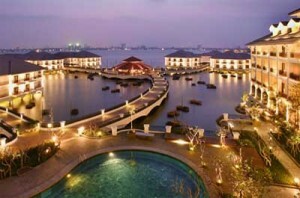 Vietnam now has a wide range of hotels from the vary basic to five-star luxury. A hotel with a permit to accommodate foreign visitors called a khách sạn- a simpler and cheaper hotel aimed at local custom is called nhà nghỉ. Foreigners can usually get a room in nhà nghỉ now but while some are fine, others are real flophouse. With all the ageing state hotels now competing with international chains and private “mini hotels”, there is no shortage of rooms so DO shop around. Looking at room before agree if to take it, checking the air condition or fan, verify the level of noise from the street and from the karaoke bar in the next room. Ask to see a cheaper /quieter room with a softer mattress and a bath, suggest they throw in breakfast or give reduction if you are staying several nights…If no agreement can be reached, and head for the next hotel down the street. Either you will be called back or you can get the same deal or better next door. You will be asked to hand over your passport at the hotel reception. Your identity will be carefully recorded and in some more far-flung or sensitive areas, your passport will even be taken on a visit to the local police station during the evening. Unfortunately, the same diligence is often sadly lacking the following morning so DON’T forget to pick up your passport when you check out! Many travelers have had to waste a day to recover his papers. One way to avoid this infuriating situation is to carry photocopies of your passport. Some hotels profess not to accept them, so just say that you have left your passport behind to obtain a visa, to rent a motorbike, or similar: it might be even true. It used to be almost impossible to stay at someone’s house in Vietnam. This has been relaxed of late, but the owner should technically register your presence with the local police. Most of the time you will not even be aware of the paperwork involved. If you seek shelter in a remote or rural area, you will usually receive unhesitating and unstinting hospitality. In the morning, despite your hangover, DO give a little money or some food: it makes for a seemly token of gratitude and you know that it’s going to people who need and deserve it. Some behavior in restaurant can be a little disconcerting. As soon as you sit down, you may be assailed by young ladies dressed in the livery of competing makes of beer. Their aim, surprisingly enough, is to get you to drink the beer they are promoting. DON’T let yourself be pushed or rushed into anything: ask for the menu and take your time. After the menu arrives, the waiter who brought it will probably stand close by, expectantly awaiting your order or even reading out his recommendations over your shoulder. DON’T be irritated by this, it is simply a manifestation of polite attentiveness. DO Notice that dishes are usually meant to be shared: everybody picks things up from the middle of the table and puts it into his bowl. DON’T protest if someone suddenly plops something down in your bowl: this is not a mistake or a gag, it is a highly courteous gesture, offering you the tenderest duck’s foot or the crispiest pig’s fallopian tube. If you are eating out with Vietnamese friends or colleagues, especially if you are male, you wil probably be expected to do a little drinking. DO try to participate good naturedly, to the level of your abilities. Although well aware that Vietnam is not a lingering culture, a local custom that both the authors of this book find particularly irritating is the snatching away of plates as, or even before, the last mouthful of food is removed from them. Again, this is probably only proof of the service and efficiency, but if it is not firmly curbed from the start, your dining experience may not be quite as restful a one as you would hope. If you are invited to the restaurant, you are not expected to pay anything and may insult your host if you try and insist. Usually, one person pays for everyone. DON’T forget, though, that if you suggest going to eat somewhere, you will be expected to pay for the whole group. Similarly, if it is your birthday, you have had a baby or moved into a new house, it is you who invites everyone else out for a meal. DO check the bill before paying it. This is quite normal practice, even if you again the waiter who brings it breathing down your neck. Extra dishes sometimes find their way onto the bill or may be something you ordered never actually arrived at the table. DON’T leave a tip of 15 percent or even 10 percent: in theory, there is no tipping at all in Vietnam, but in more up market restaurants, a small tip can be left in appreciation of good service. Dog meat. Give it go: it is not so bad, prepared in varied styles and washed down with a pleasant, sweet, milky colored rice wine called rượu chat. Duck’s blood soup. Served congealed with pepper, peanuts and herbs on top. Semi-incubated duck’s eggs. They make an unusual but nutritious breakfast, served with slivers of gingers. Watch out for bits of break or feather. Aromatic juice squeezed from cockroach-like insects called belostoma used to flavor some dishes such as pancakes stuffed with mushroom and meat. Beating snake’s heart in rice wine. Not for lapsed vegetarians, this one. Mắm tôm the highly aromatic shrimp paste with pig uterus or other meats. Roasted chicken feet after a night out.